I've always loved rhubarb since I was a little girl. It grew in dense bunches in the garden rows in Estonia where I spent my summers - deep red, with dark gnarly looking leaves. We've always made compote with it, it's was quite refreshing on the hot evening after a day spent on the beach by the sea. Preheat oven to 400°. Line a baking sheet with two pieces of parchment paper. Roll out puff pastry on the parchment, smooth out any seams. I run a roller over it just to make it nice and smooth. In a large bowl, mix rhubarb with zest and vanilla. Add sugar and flour, stir together. Squeeze the orange (or use water) over the mixture, continue to mix. The juice will help the flour and the sugar coat the rhubarb instead of settling on the bottom of the bowl. 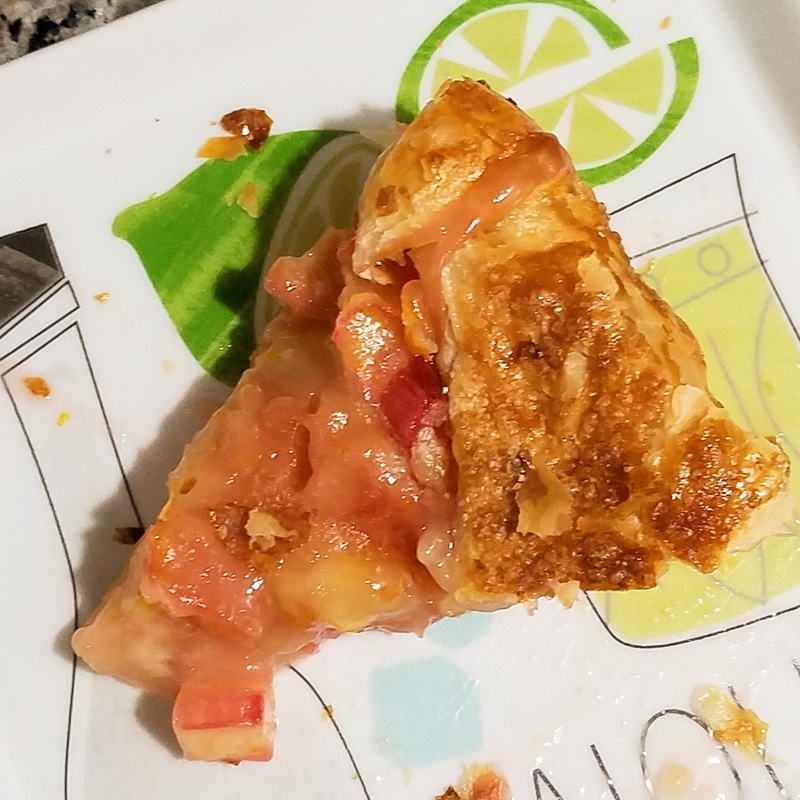 Pile the rhubarb mixture into the center of the puff pastry, leaving about an 1.5in to fold over. Don't worry about making a large mound, it will all cook down. Fold over the pastry, it will pull and stretch so you can cut off the extra dough if it suddenly starts looking like a calzone instead of a tart. Mix the egg with 1T of water to make an egg wash, brush the top of the pastry covering all the dough. Sprinkle the dough evenly with raw sugar. 25 minutes in the oven (or until the dough is golden brown and the filling is bubbling. I set the timer and went outside on the patio, totally forgetting about the oven so mine so it was longer than 25 mins). The tart will puff up while baking and the filling might bubble over a bit. It deflates as it cools. Cool completely. I let it sit on the baking sheet until the steam died down from the filling, then moved it to the cooling rack. Can be served with a scoop of vanilla gelato, but I like it just the way it is.